March 22, 2013 – Just one more week of Read an Ebook Month! I’ve just created a new website to encourage book authors (and their family and friends) to share the books and authors they love. As well as any blogs, websites, articles, Facebook posts, Pinterest pins, etc. that feature books, authors, writing advice, or publishing tips. This is a free service. I just want to encourage more authors and their friends to share the books and authors they love. As a bonus, this is a social bookmarking site, so you can also save your favorite book author sites, book pages on Amazon, blog posts on writing, book blogs, and more for later reading. And you can also re-share every listing via Facebook, Pinterest, LinkedIn, Google+, and Twitter. Yes, that means you can spread the love. Note: In less than 24 hours, with little promotion, the website has already had 670 views. It will get thousands of views in the next two weeks. You can be part of that traffic. Join now! Romance Sells, a quarterly publication of the Romance Writers of America, is looking for booksellers and librarians to write articles on shelving practices, reader advisories, cataloging, displays, author events, and marketing. Why should this interest you as a book author? Simple: Offer to help your favorite bookseller or librarian to write an article for Romance Sells. Work with the bookstore or library to create an event featuring your romance novel (yes, this tip will only work for romance writers). 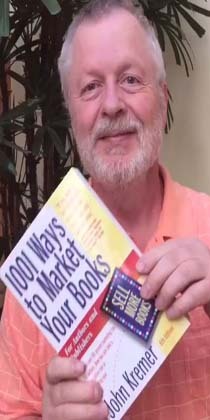 Then write an article on the step-by-step procedure for producing a successful author event. Booksellers interested in writing an article should submit a short bio, a list of prior publications, and a summary of the proposed article via email to bookseller@rwa.org. Librarians should do the same, except the email address is: libraries@rwa.org. Now, for other book authors, you can do something very similar. Work with your local bookseller or librarian to write an article for Library Journal, Publishers Weekly, Booklist, etc. Again, make sure the article features an event built around YOUR book. I wonder how many non-romance book authors skipped this article and missed the advice in the above paragraph. Note: You should always read my entire tip because I often throw such curve balls and additional insight into many of the tips I write. For that reason, you should also read the quote below. A great tip. Be sure to answer someone’s prayer today! Or, if you don’t believe in prayers, then answer their request, their question, their pleading.